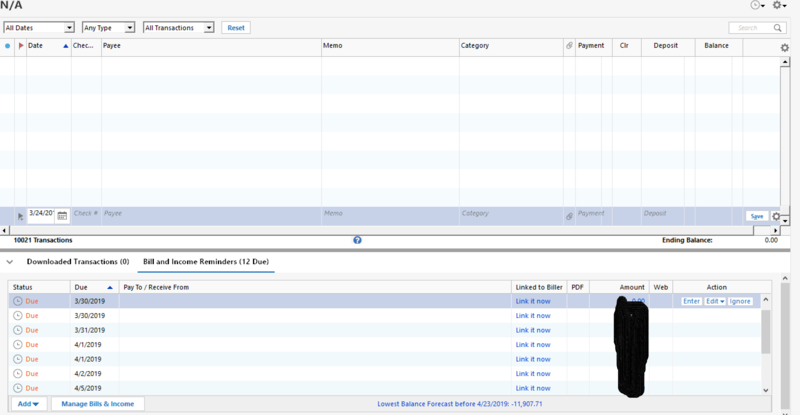 One other thing: my scheduled transactions are all there, but the payee is blank. Values (where it's a set value) is present. I would suggest continue restoring as far back as needed to find a file that does not exhibit this issue. If you could provide a screenshot, that may shed light, but on the surface, it's sounds like a file corruption. What operating system? If Mac include that information, if Windows 10, what is the Build information? Thanks for the responses. I've not been saving different versions of the backup, just saving over it each time. Should have thought about actually testing to be sure it worked every now and then apparently. Here's screen shots and more information. 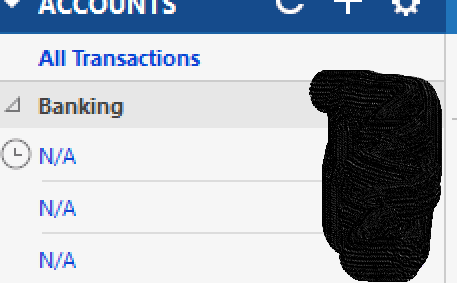 Notice the "N/A" under banking, and the payees are blank in the reminders. As is all transactions. And I noticed this time that the balance when I click on the first "N/A" is different in the details than it is in the summary (in the details in balance is $0, in the summary it's what I think was correct (close enough that bells wouldn't have been going off at least). You wrote above: "Thanks for the responses. I've not been saving different versions of the backup, just saving over it each time. Should have thought about actually testing to be sure it worked every now and then apparently. " 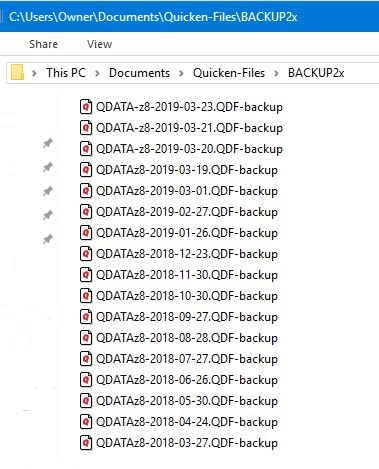 You might think that only one copy of the Quicken Data File is necessary for a Backup. I guess that what happened to you proves that false. You can't have too many backups. When I do Backups, I always do a Manual Backup, as I have Automatic Backups turned off. And I checked Add date to backup file name. My backup location Quicken Backup on my Mapped Hard Drive. I have 255 Manual Backups and counting. 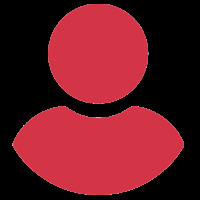 You might consider to start over with a New Quicken Data File and do Manual Backups instead of Automatic Backups. ... I've always kept a backup of my quicken file, ensuring to save every time I use quicken so I do not lose track of any entries. Where and how were you creating the Backup file ? @ps56k I was backing up to a Onedrive folder, which is where I restored from. The other files I've looked at seem to be OK (always have been on Onedrive). Thanks @thecreator I will start doing that from now on. I guess I hadn't noticed that option before. Did not see where you mention system backups. 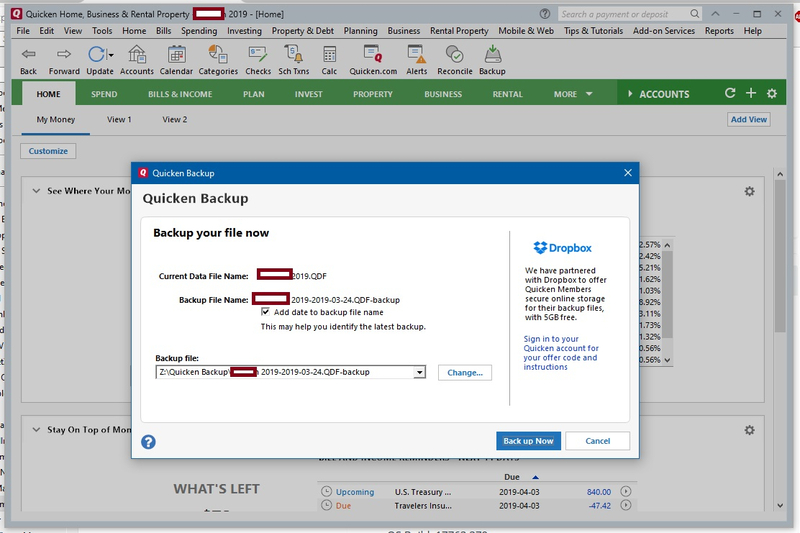 Quicken will create backups unless you specifically disable it. 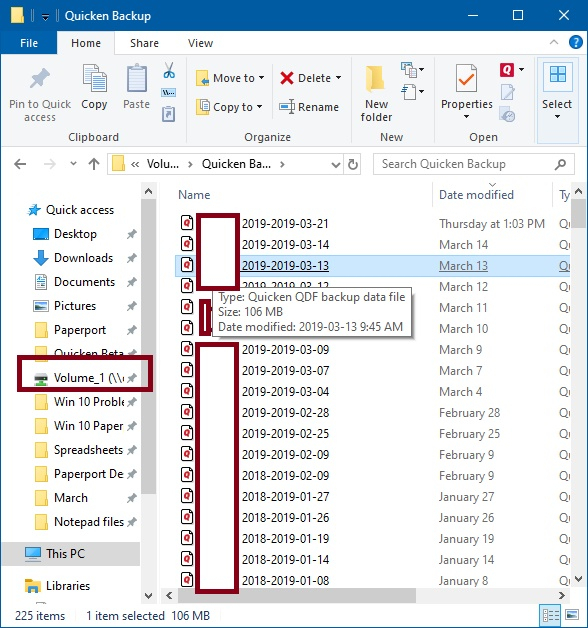 Look in the documents folder for Quicken>Backups.